Cultures vary in fascinating ways across the world, and it's always an eye-opening experience the first time you visit a new country and discover all the odd things that the people do there. Of course they're only odd from your point of view - to the locals it's just the way things are done, and the way you do it at home is odd. What doesn't come as a surprise are the big obvious things. If you go to Italy, everyone speaks Italian. And yes, there are lots of places selling pizza and pasta and gelato. You kind of expect all that. But how do you buy apples in an Italian supermarket? That's strangely different to the way I do it at home, and something I totally didn't expect the first time I visited Italy. I went into a shop to buy apples, and suddenly I realised I didn't know how to do it. I had to watch other shoppers as they weighed their own apples and the machine printed out a sticker, which they stuck on the bag, and then took to the cashier. It's these odd little things that I had no idea would be different overseas that I find endlessly fascinating. And sometimes they can be frustrating too, as you realise you have no idea what all the people around you are doing. It makes you feel a bit as though you were from a hunter-gatherer tribe and found yourself in a modern technological city (although perhaps not quite so severe as that actual case would be). 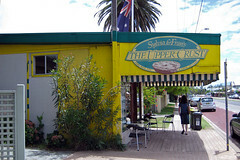 Australian flag, over a meat pie shop. You need to eat meat pies too. I'm a week late for Australia Day, but oh well. 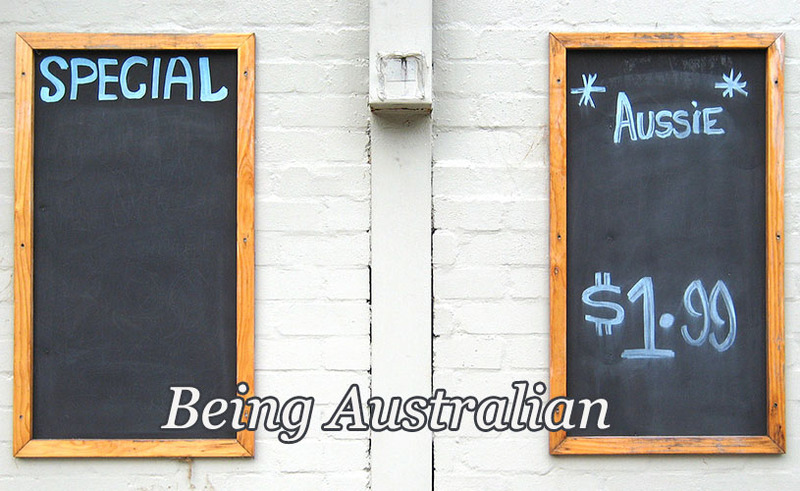 Here are some useful tips for How to be Australian. Be polarised about your flag. In most countries pretty much everyone agrees that the national flag is something to be proud of. (Maybe a few don't, but not many.) Not so in Australia. While there are plenty of people who love our flag, there are a lot of Australians who hate it, and many more who simply think it's inappropriate and should be changed. The Australian flag contains the Union flag of the United Kingdom on it. A lot of Australians think this is a reminder of the injustices of the colonial era and that Australia was once subservient to another nation. There is an active and growing movement to change Australia's flag. Younger generations are more in favour of changing the flag than older ones, and in my opinion, it's just a matter of time until the movement becomes overwhelming and we do change it. Canada did a similar thing, changing their flag in 1965 from one similar to Australia's current flag, to the now popular maple leaf design. Watch this space. To be an Australian, you can say you hate your country's flag, and that's not unusual. Ride in the front seat of taxis. If you're alone and you catch a taxi, you ride in the front seat. End of story. Wear a T-shirt and shorts to the symphony. We have fancy cultural events in Australia like symphony concerts and operas. 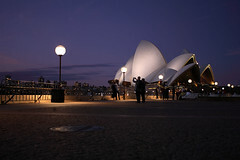 Where I live in Sydney, I'm lucky enough to have the Sydney Opera House as my local venue for such things. It's a swish venue, and indeed many people get dressed up in fine evening wear when they attend performances there. But it ain't compulsory. There is no dress code, and nobody will bat an eyelid if you show up in shorts and a T-shirt. On warm summer nights, it's actually the best thing to wear, and many members of the audience will be dressed very casually. Tipping is one of those "weird customs that foreigners do". In the egalitarian culture of Australia, many people consider tipping to be downright insulting, as though you're looking down on a lowly servant who you're gracing with your spare change as you look down your nose at them. This means that when Australians travel somewhere where tipping is the norm, they feel really awkward and uncomfortable doing it. So some Australians don't tip even when travelling overseas. 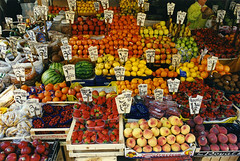 Personally, I make a point to find out what is expected where I travel and tip appropriately if it is the local custom. But it still makes me feel weird. Especially don't tip taxi drivers - in fact, if the fare on the meter reads $30.85, to be truly Australian you must have the taxi driver say, "Make it thirty, mate." Wait for traffic to stop before crossing. 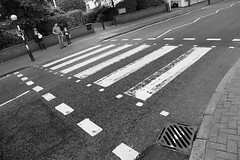 When I first visited the USA, I tried crossing a road once at a pedestrian crossing (a.k.a. a zebra crossing, though to be Australian, don't call them that). There were cars approaching, so I stood on the kerb (not the "curb" if you want to be Australian) and waited for them to stop. They slowed down a little as they approached, but then they sped back up again and zoomed through the crossing! I was taken aback and thought, "How incredibly rude! They should stop to let me cross!" I later figured out that if the drivers slow down a bit but you don't actually step out into the road, they assume you're not going to cross and speed up again. In Australia, you stand on the kerb and wait, and the cars will stop. You only step out into the road once you're absolutely sure they are not driving through the crossing. If you're driving and you see someone standing near a pedestrian crossing, you stop and wait for them. You only continue if the pedestrian makes a clear signal to you that they do not intend to cross at this time. I learnt that in the USA you have to be a lot bolder and more assertive as a pedestrian, or the cars will simply not stop for you. On a later trip to Italy I discovered that they do things differently there too. As a pedestrian at a crossing, you must walk boldly out into the traffic, and the cars will swerve around you. That's their way of not hitting you. Don't wait for traffic to stop before crossing. On the other hand, at traffic lights, feel free to dash across when the light is red for pedestrians if there's a gap in the traffic. Everyone does it - you'll be left there all alone if you wait for it to turn green. I've noticed that in some countries nobody dares do this - they all wait for the green light. When crossing roads in foreign countries it can be almost impossible to look like a local. 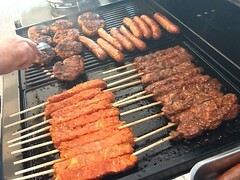 The other possibility for Christmas meals is a barbecue. Eat seafood and salads for Christmas. Christmas time is in the summer in Australia, and it is hot, sometimes very hot. The traditional northern hemisphere standards of roasts and other heavy, warming foods don't go down too well. On the other hand, we are blessed with an abundance of fine seafood. The seafood lunch, usually eaten outdoors, is now pretty much a tradition for an Australian Christmas. Decorate with fake snow in summer. On the other hand, some northern hemisphere traditions stick around. Even though almost all Australians live in places where it never snows, we still associate Christmas with snow, thanks to all the portrayals in northern hemisphere film and TV. So we use fake snow decorations for Christmas. In summer. Everywhere I've travelled overseas and ridden on the local metro or subway system, there have been signs indicating that eating on the trains is forbidden. (Long distance trains are different - you tend to be allowed to eat on those.) Not so in Australia. I can catch a local urban commuter train from near my place, fifteen minutes into the heart of Sydney, and eat Chinese take-away, or pizza, or a burger, or whatever else I can carry with me while travelling. And wash it down with a milkshake or a coffee or whatever. The only thing you can't consume on a train here is alcohol. Most commonly people just have snacks on the train, but I've had my share of take-away meals while riding the Sydney metro. 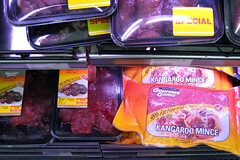 Kangaroo meat for sale in my local supermarket. Voter turnout in Australian elections is (officially) around the 95% mark. There's a reason for this: It is compulsory to register on the electoral roll, and compulsory to register a ballot. (This does not mean that you have to vote for one of the candidates; you can spoil your ballot if you wish.) Elections are also held on Saturdays, when most people are not working. The penalty for not registering a ballot is a fine. Some people think that being "forced to vote" is undemocratic or an infringement of rights, but the majority of Australians are happy with the system. To be Australian, you'll need to be too. Eat your national faunal symbol. What animal most symbolises Australia, both overseas and to Australians themselves? The kangaroo. What animal can you find in the butcher section of your local supermarket, in fancy restaurants, in burger joints, and generally anywhere you can get a feed? Kangaroo. It's good, lean meat, and it's easier and less environmentally damaging to raise in Australia's climate than cattle. The second animal on our coat of arms, the emu, can also be found readily as meat, though is less common. If you're invited to a party at a friend's place, they may well ask you to "bring a plate". This means a plate of food. When everyone brings something to munch on, you get a variety of yummy food and no single person is left paying for it all. 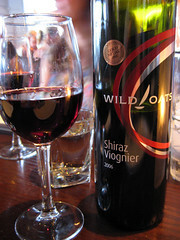 Wine that I brought along to a restaurant. Almost all restaurants allow you to BYO - bring your own - wine to drink with your meal. And most people do. When you go to a restaurant, take a bottle from home, or nip around the corner to the nearest bottle shop (not "liquor store") and pick up a bottle on the way. If you're driving, you could use the drive-through section of the bottle shop to buy your wine without even getting out of your car. The restaurant will charge you corkage of a couple of dollars per diner if you BYO, but it still ends up cheaper than buying from the restaurant's wine list, and your selection is much greater. And if you don't drink it all, take the bottle home with you for later. Eat all sorts of foods. The Australian food scene is very cosmopolitan. Some other countries are too, but some aren't quite so broad. To be Australian, you must be intimately familiar with at least British, Italian, Greek, Turkish, Lebanese, Indian, Thai, Malaysian, Indonesian, Vietnamese, Cantonese, Japanese, American, and Mexican food. Some exposure to French, Dutch, German, Spanish, Moroccan, Pakistani, and Nepalese cuisine won't hurt either. Oh and "contemporary Australian", which is kind of a fusion of any or all of the above. Security guards and bodyguards are not a big thing in Australia. Sure there are some, but they never wield submachine guns like in some places. (It's quite a shock to visit places like Paris or Rome and see guys with submachine guns walking down the street!) And the sorts of people who might move around with a huge retinue of guards overseas either require a scant few or do without completely. Our politicians are particularly relaxed. I live not far from the former Prime minister John Howard, and since he lost the job in 2007 I've seen him several times, doing his walking exercises in local streets, without anyone accompanying him. One time I was having dinner with my wife in a pizza place up the street, and Mr Howard walked in by himself to pick-up an order (he was wearing a polo shirt and shorts). Another time when Howard was Prime Minister he was on a meet-and-greet with the public. One guy went up to him, gave him a full-on body hug, then melted back into the crowd. TV pictures later showed the guy had been holding a long screwdriver in his hand at the time. He didn't want to stab the PM - apparently he was just a local worker nearby who decided to give the PM a hug, and took his screwdriver with him. There were some security personnel around but they didn't stop the guy. 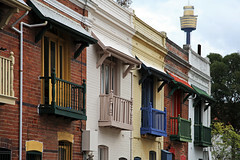 Terrace houses in Woolloomooloo. No, really. Make fun of people. Not just some people - that'd be racist or sexist or whatever. Make fun of everyone. And everything. Nothing is sacred. If they can't take a joke, well then that's their own look out. Make fun of yourself too. Everything's better when you can laugh at it. Pronounce names like Woolloomooloo, Maroochydore, Goondiwindi, Coonabarabran, Gulargambone, and Wallerewang without batting an eyelid. The Australian Aboriginal peoples gave us many delightful words for our language, and oodles of cool place names. The native languages tend to be very melodic and mellifluous, creating longish words of multiple syllables. Some can be tongue twisters to the uninitiated, but an Australian will be able to rattle off even unfamiliar Aboriginal place names with ease. Given any contest that you know little about, ask who is the favourite. Then support the other side. Unless they're your team, whoever's most likely to win is exactly who you want to see lose. And the one you want to see win? You barrack for them. Never "root" for them - that's obscene and ridiculously amusing. Be both stoic and blasé. If it looks like something might go wrong, or in hard times in general, be stoic. "Yeah, we lost the house in the floods... but you gotta laugh. She'll be right, mate." If things are going well, be blasé. "Yeah, we won the lottery. Never have to work again. I suppose that's good, in a way." Wikipedia calculates it a different way and comes up with a figure closer to 80%. Last Modified: Monday, 23 December 2013; 16:37:58 PST.